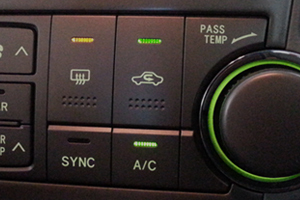 When your vehicles air conditioning system start to fail and the heat is unbearable, Precision Auto can help. Over time, A/C fittings become loose, O-rings, hoses and seals wear out – and your A/C stops blowing cold. When refrigerant leak it is not only harmful to the environment, it's also harmful to your car. Leaking refrigerant can damage your vehicle's evaporator and compressor. Getting your vehicles air conditioner serviced at the first sign of trouble will save you both time and money. At Precision Auto, all AC repair and AC services are performed by ASE-certified technicians who have completed training through EPA-approved AC programs. Your vehicle is in good hands with our expert auto technicians, they will thoroughly examine your vehicle's A/C system to see if there is a leak – and if there is, they'll stop it before it can cause more damage. A/C systems are just as important in the winter. Your air conditioning system provides cool air in the summer; it also de-humidifies the air, eliminating moisture when you’re running the defroster in the winter. A properly functioning A/C system is especially important in the winter to remove moisture that fogs up or freezes on the inside of the glass preventing you from seeing clearly. Copyright © 2014 Precision Auto.